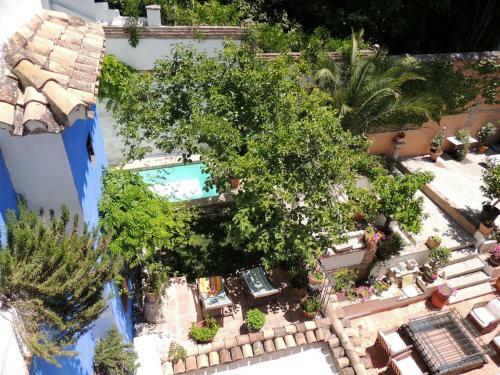 The Carmen Del Cobertizo has 7 charming rooms and features a seasonal swimming pool. Located in the vibrant Albaicin, the hotel has easy access to numerous dining and entertainment venues. The Carmen Del Cobertizo features massage services, family/oversized rooms and a sun deck. Also available for guests are babysitting / child services, meeting rooms and luggage storage. Guests can also make the most of the hotel's garden. The air conditioned rooms at the Carmen Del Cobertizo are well-appointed. Complimentary toiletries, a desk with an electrical outlet and a hair dryer can be found in each room of the hotel. Honeymoon suites are also available. Guests can take advantage of a generous breakfast, which is served on request each morning. Room service is also available during certain times. Located close to a number of popular hot spots, the hotel is near lots of bars, nightclubs and quality places to eat. Granada Cathedral, Royal Chapel of Granada and the Madrasah of Granada are within a short 10 minute walk of the hotel. This hotel is 1012 metres from the Alhambra entrance, 370 metres from Plaza Nueva (the absolute centre of Granada), 1641 metres from the train station and 2890 metres from the bus station.